Meet the zoo animals who were left to die. Three lions, two bears and two guinea pigs were stranded in the small town of Gyumri, Armenia, after their owner abandoned them. For months they've lived in "horrific conditions," International Animal Rescue (IAR) reported, trapped in tiny concrete cells and, at times, without food or water. And the horror of their circumstances has begun to take its toll. Photos show haggard and disheveled animals peering out from their would-be coffins. The bears look particularly affected, their matted fur filled with straw and dirt. One of the bears collapsed a few weeks ago, IAR said, and is still very weak. 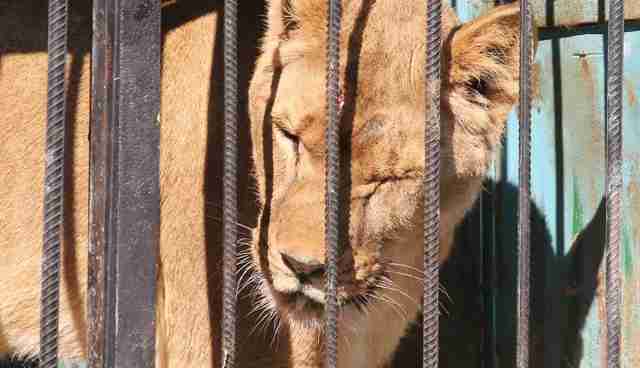 One of the lions has wounds on her head from repeatedly slamming it into the bars of her cage. "The animals are in an appalling state," Roger Allen, a photographer who recently shot the dilapidated zoo, told The Dodo. 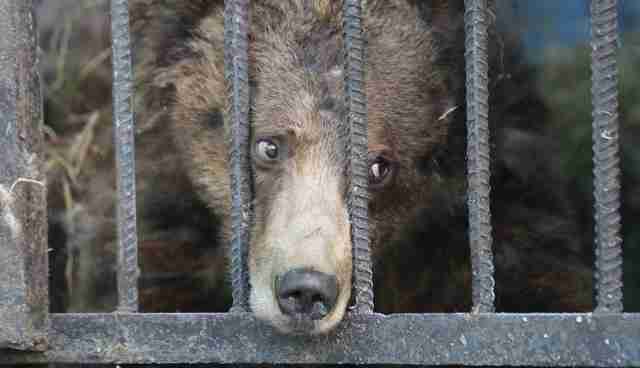 "The bears were pacing around in circles in frustration and desperation at being caged in such a small area. The lioness, Mary, the mother of the two cubs, hardly moved. She lay with her head against the bars." 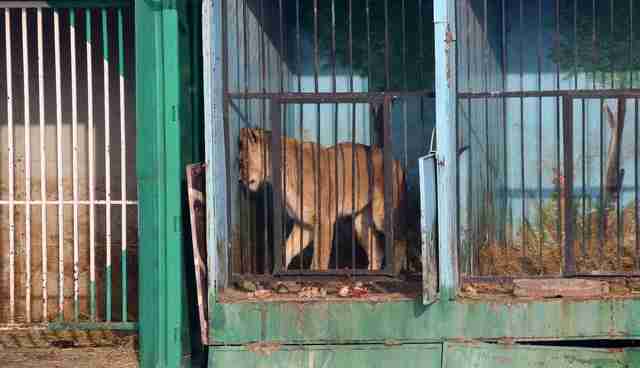 "Her cubs prowled, restless, around their two separate cages which was a metal lorry container," Allen said. "On the back wall of their cages were holes in the wooden panels where the cubs had tried to claw their way out." It's still unclear exactly how the animals ended up in the ruins of the zoo - Allen said they were the former pets of an Armenian billionaire oligarch who purchased them to use at jungle-themed parties. At some point, he said, the owner abandoned them and his whereabouts are currently unknown. Armenian outlets have named the owner as Stepan Vardanyan, a businessman who set up the zoo in 2010 but later ran into financial and health troubles. He's reportedly told local media that he can't care for the animals but doesn't want to see them put down, according to Armenia Now. In any case, the end result was that the animals were left to die. According to some reports, many of them did and the seven left are just the survivors. But where officials and the owner turned their backs, locals stood up to help. According to Allen, a local elderly couple, Hovhamnes and Alvina Madoyan, stumbled on the remains of the zoo and couldn't bear to let the animals waste away and die. "I lost my job, I had nothing, my wife and I were walking by the deserted zoo when we heard these terrible cries of animals in torment," Hovhamnes told Allen, according to a statement released by the photographer. "We came in to see the lioness and her cub literally frothing at the mouths from lack of water." Since then Madoyan and his wife, Alvina, have dedicated their lives to caring for the animals. Though the couple is retired and of limited income, they moved into a nearby shack and feed the animals with what little scraps of food they can find. "My wife and I can't bear to see God's creatures in pain," Hovhamnes reportedly said. "We fetched water from them and then organized some meat from a local slaughterman. That is how we scrape by." Both the Madoyans and Allen reported that the animals seemed to be losing their minds in the tiny confines of their cages. "They are sad and lonely and, when they can be bothered, pace up and down their cages, showing the signs of being driven mad by boredom and inactivity," Hovhamnes said. But for the first time, real help might be on the way. An international coalition of animal rescue groups has come together to bring help to the abandoned animals and finally give them a real home - and some of the animals are already on their way there. 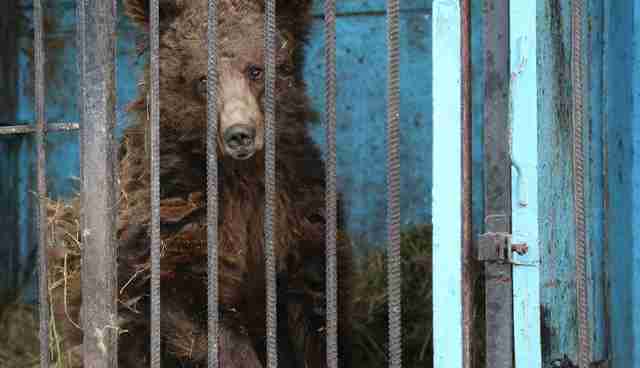 On Friday a ground team led by Worldwide Veterinary Service (WVS) transported the bears to a temporary enclosure at the Yerevan Zoo, where they'll await permits before moving to the Libearty Bear Sanctuary in Romania. As the animals were not microchipped or vaccinated, relocating them is a complicated process. "They are still quite weak, each weighing only around 50 kg, but are being fed and cared for," WVS said in an email provided by IAR. 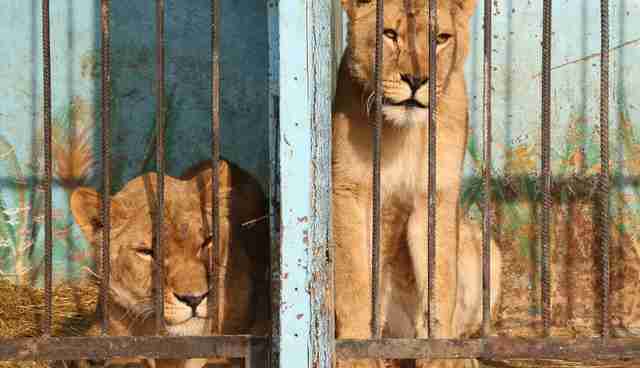 Next up are the lions, who need to be relocated to a more spacious temporary home before they decline further. WVS said the lioness with the head wounds is in need of treatment. "We still have a long way to go," WVS said. But while saving these animals is the main focus for rescuers right now, their plight also raises bigger issues about the state of animal welfare in the country. 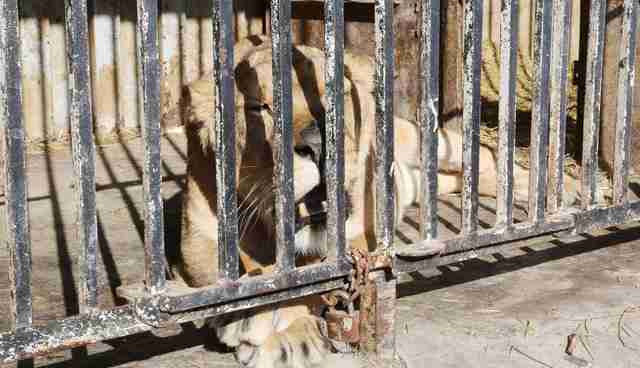 "The animals at Gyumri Zoo are just a few of the animals being kept in substandard conditions in Armenia," WVS wrote. 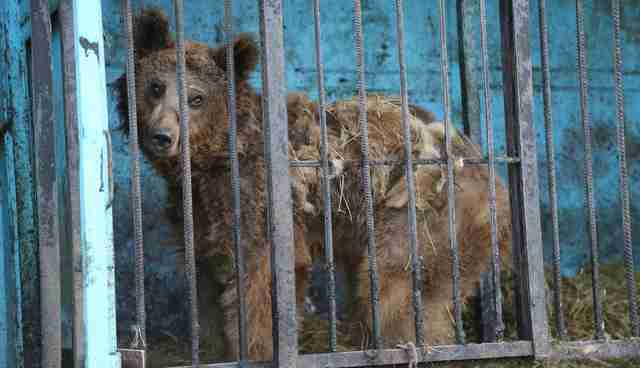 "There is an urgent need for legislative change to protect wild animals in Armenia, not least to protect the welfare of the 60+ bears currently kept in abhorrent conditions across the country." But the first step will be lifting the Gyumri animals out of the hell they've lived in for so many years - which promises to be a lengthy journey. "We are still far from reaching a happy ending for these poor neglected animals," Lis Key, PR and communications manager at IAR, told The Dodo. "But I have huge confidence in everyone working towards this goal and don't doubt that they will eventually achieve it." If you'd like to contribute so that these animals can be relocated more quickly, you can make a donation to WVS here (Please note: This is the only official rescue effort and we cannot confirm where other fundraising pages direct to). The coalition working to save these animals includes IAR, WVS, Born Free Foundation, Brigitte Bardot Foundation, Pro Paws, the Foundation for the Preservation of Wildlife and Cultural Assets, and SOS Gyumri Zoo Animals, a group of locals who've banded together to help the animals.